Stuart Carrington said he felt at home on his Crucible debut after putting up a gutsy display in his 10-6 World Championship defeat by Judd Trump. World number 69 Carrington trailed Trump, the second favourite for this year's title, 7-2 after the first session of his first-round match. The Grimsby potter, 24, closed the gap to 9-6 before Trump edged to victory. "There were no serious nerves at all. You get this buzz and you don't want it to end," Carrington told BBC Sport. "I was more nervous standing waiting to go out there, but as soon as I did I couldn't believe how relaxed I felt. "There were no serious nerves at all, which I was really surprised about. "It's the best place to play in the world and if you can play well here you can play well anywhere. And I proved I can play pretty well." 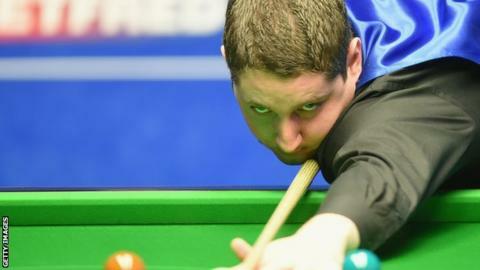 By qualifying for the Crucible, Carrington had already ensured he finished in the top 64 of the world rankings at the end of the season. "My main aim was to break in to the 64," he said. "I left it a bit late but I managed to do it by qualifying for this. "There are lots of positives to take and hopefully I can kick on next season and qualify for as many big venues as possible." On the match itself, Carrington added: "Judd played really well but I was pleased with the way I fought back. "I didn't want to lose 10-2 so in the second session I went for my shots, played pretty well and scored pretty heavy and put him under some pressure. "I enjoyed it and felt comfortable all match. Hopefully next year I can come back."